It dawned on me the other day that there is a major flaw in the electrical safety body of knowledge... at least a flaw in the general public's approach to arc flash incident energy levels that are perceived as "low". Basically, I think no matter what the value of the arc flash incident energy, even if it's below the threshold of a second-degree burn (1.2cal/cm2), you should be wearing arc rated PPE when you are doing a task that exposes you to the hazard. If you're interested in hearing my explanation on this then keep reading. What exactly is an arc flash? Well... the easiest way to think of it is as a big nasty explosion that starts inside of an electrical panel. An explosion so powerful it can blow the doors off equipment and so hot that it vaporizes everything inside the panel in the blink of an eye. Not something you want to be involved with. Seems like there was more than one hazard there in my explanation... and there was, in fact, there is a group of hazard all packed into this one event. So what are they? This is the incident energy... it's like a sunburn, except you were standing on the sun when you got burned. Actually, it would be more like standing on the star Rigel (I had to look that up) which is around 20,000 degrees Celsius. So the arc rated PPE protects you from this heat energy... remember that. Next, you have a fireball. This is what you would most remember from watching an arc flash video on YouTube. So one thing to note is that if you removed the fireball from the event you would still get burned... from the incident energy. The only problem is that there still is a fireball so you need to worry about that as well. Thankfully the arc rated PPE will extinguish the flames as soon as the source is removed. What people often forget is that even if the incident energy is below the threshold of a second-degree burn you still could be engulfed in a massive fireball. One that will instantly light everything you are wearing on fire. Cotton burns extremely well. This is where the arc rated faceshield comes in... but also this hazard doesn't go away when the incident energy is below 1.2cal/cm2. So you'd better keep your mask on. The key is that you need to treat every arc flash as if it can have serious consequences. Even if you don't receive a second-degree burn from the incident energy you could still be on fire and blind, which is a nasty combination under any circumstances. How do we approach the issue? 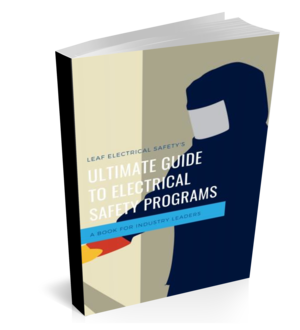 If you have an electrical safety program in place then all you need to do is adjust when you wear the PPE. As long as an arc flash hazard exists then you need to be protected. The key is now to determine the likelihood of an arc flash happening, and if you think it can, then wear the PPE. I hope you enjoyed this article and if you did please share it on social media.